St. Ann & the Holy Trinity Church at 157 Montague Street advises BHB readers that it’s not too late for pets and beloved stuffed animals to receive a St. Francis Day blessing, a remembrance of St. Francis of Assisi’s love for all creatures. 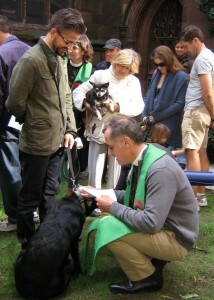 Come by Sunday, October 14, at 2 p.m., and gather in the church’s North garden on Clinton Street in Brooklyn Heights. Should it rain, the blessing will take place inside. Photos from last year’s blessing can be viewed here. Read more about St. Francis Day here.